If you ask an experienced winelover, “What are the greatest Italian red wines?” It’s likely their reply would be, “Barolo, Brunello and Amarone!” But how many people can say they have sampled Amarone? Barolo is the celebrated Piedmontese wine made with Nebbiolo grapes. Brunello is made with Tuscan sangiovese grapes. And the Amarone…well, that is a different story. Amarone della Valpolicella comes from a region close to Verona, the renowned Venetian city of Romeo & Juliet. It is not made with just one grape variety but is a blend of local grapes. 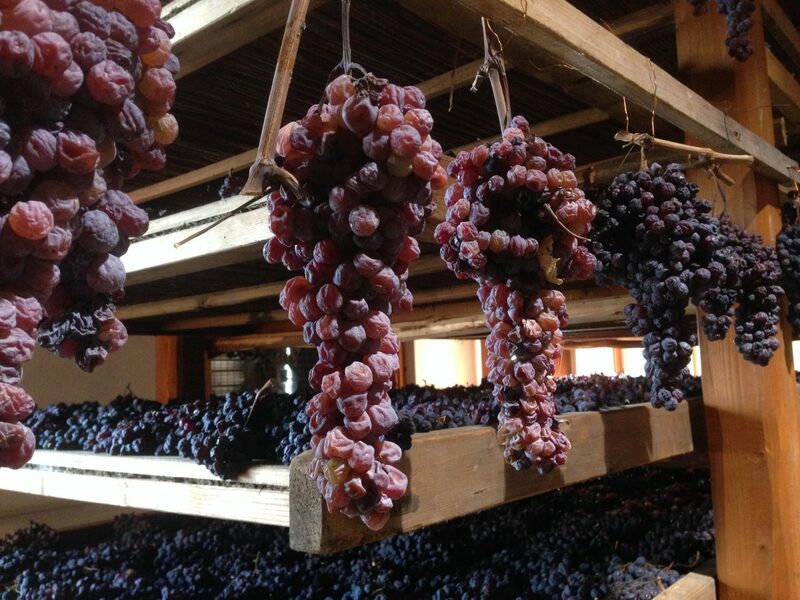 And it is not made from fresh grapes like Barolo and Brunello but from totally dried bunches of grapes. Confused? Ok, let’s start from the beginning: the location and the name. The actual name of the wine is “Amarone della Valpolicella.” Valpolicella is its production area: a zone located in northeast Italy, an area 15 miles wide and seven miles long (25 km by 12 km), which is about 9 miles (15 km) east of the famous Lake Garda. We are in the Veneto region, with the city of Verona to the south, in the middle of a complex system of valleys that flow north-south. Valpolicella has 13 valleys, but I don’t want to make it too complicated. Just remember there are three main areas: Classic Valpolicella (the most historic zone of wine production), Valpantena and East Valpolicella which is the most recent zone added to the denomination, and which eve partially overlaps the white wine Soave denomination. Valpolicella has been inhabited since prehistoric times, and today wine lovers all over the world know it as a land of great red wines, whose origins date back to the Roman era. But the truth is that its most prosperous wine, the Amarone della Valpolicella DOCG, is a pretty recent product. It is commonly said to date back to the 1950s, though it is possible that some producers made it in the 1930s. It’s always difficult to know the exact date of the birth of a wine, especially in this case because it happened before official production rules were established by law in Italy. However, I can assure you that the Romans did not drink wine that is anything like the Amarone wine we have today. Another myth that is worth debunking is about the meaning of the name Valpolicella. It doesn’t mean “valley with many cellars”, although plenty of people will tell you so. That would be very appropriate and romantic, right? Unfortunately, the truth is different: “Valpolicella” means “valley with many shoots”, referring to plants that sprout on the small, low heaps of sand along the banks of the Adige river. Thanks to the topography of gentle hills with plenty of water nearby, and to the mild climate, agriculture has always been the most important activity here, since ancient times. And people in this region have always made wines with the local grapes, which are mainly red. At present, Amarone is one of the major wines of this region. In order of significance, there is Valpolicella (a fresh and fruity daily wine), Valpolicella Ripasso (or simply “Ripasso,” a full-bodied Valpolicella with Amarone’s flavors), Valpolicella Superiore (a more alcoholic and elegant Valpolicella), Amarone, and finally Recioto (the “father” of Amarone, an ancient and rare sweet red wine). All these wines are basically made with the same blend of grapes, but with quite different techniques. The traditional grape blend used to be Corvina Veronese, Rondinella and Molinara. But for a number of years Molinara has been almost totally eliminated; only a very few traditional producers still include it. The current favored blend is Corvina, Rondinella and Corvinone — along with smaller amounts of other indigenous varieties (Croatina, Negrara, Oseleta, etc), according to the personal “recipe” that each winery has developed for itself. 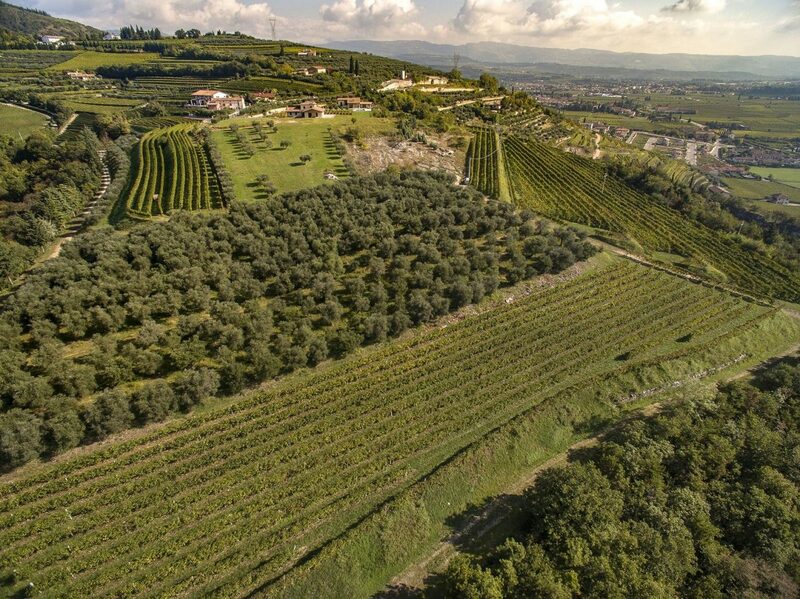 Another important detail about Valpolicella wine is that generally speaking (and with very few exceptions) there are no “reserved” vineyards: all the grapes come from the same vineyards. It’s the winemaking process and the selection of grapes that changes the grapes into different wines. And the selection depends on the quality of the vintage. The selection happens throughout the harvest itself. 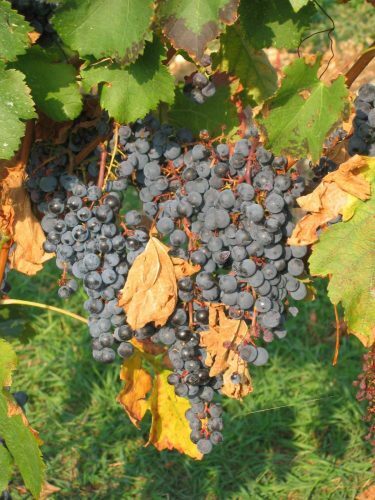 The grapes that are chosen to make appassimento wines (from dried grapes) like Amarone and Recioto have to be the finest, and they are picked earlier than the others. After harvest, the Amarone grapes are laid out in special rooms (called fruttai) to “rest” for 100-120 days, depending on the vintage. During that period they lose water, but concentrate sugars, flavors and other elements. Later on, they are softly crushed and aged in big oak in barrels, barriques or even (more recently, and often just experimentally) in amphoras. The outcome is a velvety red wine, high in alcohol, full-bodied, with rich scents of dried plum, chocolate, leather, tobacco, mint, dried fruits…and much more! A wine you can drink by itself, but which pairs even with red meats, seasoned cheeses, and cured meats. Ripasso is a slightly different wine. The alcohol is just a bit lower than Amarone, but the taste and the aroma are very similar. In many countries it is called “baby Amarone” or “poor man’s Amarone” due to its lower price – which is another reason it is so successful. To make Ripasso, a young Valpolicella wine is poured onto the pomace of Amarone (or Recioto), triggering a second fermentation which raises the alcohol level and gives the wine aromas similar to those of Amarone. As for the Recioto della Valpolicella wine, although at present it is not as popular as the Amarone or as widespread as the Ripasso, it is actually the oldest wine of the area — along with the every-day Valpolicella. In the past, in fact, the most valuable and desirable wines from this area were slightly sweet wines like Recioto della Valpolicella – and now we see them being appreciated again. Recioto is made with grapes that go through the appassimento (grape-drying process); the fermentation process gets interrupted when the wine is poured off the must at the moment when the producer knows that the wine has the right balance of sugar, alcohol, and acidity. That requires a deep knowledge of the whole process, because if the producer doesn’t catch it at the right moment, the fermentation continues and the wine becomes totally dry. (In fact, legend has it that Amarone was born from a completely fermented Recioto, which a distracted cellarman forgot one day). Along with great knowledge, making a great Recioto requires a certain type of sensitivity, and a personal taste for sweet wines in order to avoid making wines that are cloying and trivial. Today it is getting difficult to find these types of wines — and the people that appreciate them — especially abroad. An authentic Recioto wine has a fragrant aroma, with scents of plums, raspberries, cherries, nuts, dates, chocolate and light scents of violets and other wild red flowers; in the mouth you find cherries wrapped in dark chocolate, sweet spices and coffee powder. The wine is smooth and silky, very elegant and perfectly balanced, with a long and satisfying finish.